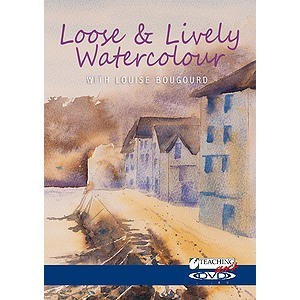 Louise Bougourd is a renowned watercolour and mixed media artist with a characteristic loose and lively style which she has honed over many years. Her paintings are atmospheric and intuitive. Her work is inspired by her local surroundings of moorland, coastal scenes and estuaries, she is also inspired by hedgerow flowers. Louise enjoys using pure watercolour experimenting with the effects she can achieve with her thorough knowledge and understanding of this medium. She also loves to use a range of media to create vibrant and exciting art; soft pastel, oil pastel, gouache and acrylic can be seen in many of her paintings. Louise continues to explore with a passion and enthusiasm that is infectious. Louise has developed a reputation as an inspirational teacher with a willingness to share her knowledge and enthusiasm in her classes, workshops and her writing. Her work is exhibited at South West Arts, Sidmouth, she regularly holds solo exhibitions.